Do you want to know what people are think about that new town plan, do you want to ask peoples views on a new product, perhaps you are carrying out a straw poll or do you want to collect data to input into a scientific model? 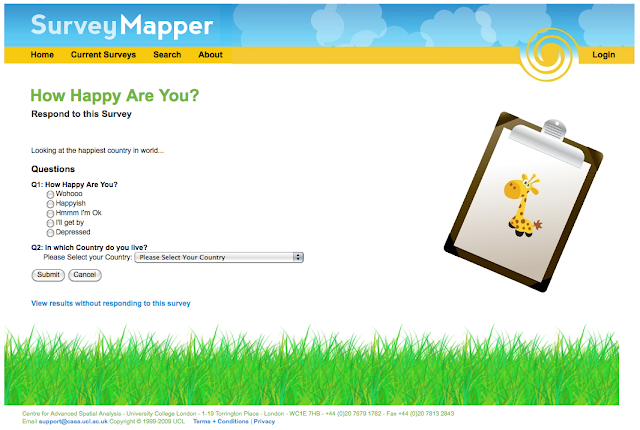 If the questions can be asked or surveyed, all you need is SurveyMapper. The beta release of SurveyMapper, a free real-time geographic survey and polling tool from the nice people at the Centre for Advanced Spatial Analysis, University College London, is looking like it is only a few weeks away. If you have used other ‘polling sites’ then you will be up to speed, except we have taken away the restrictions and added real-time mapping into the mix. We currently have the UK covered down to postcode level (that’s the level of your street), the world divided into countries with a higher level of detail coming soon. As part of the move towards Beta and allowing people to set up their own questions, we have created a test survey to find the worlds happiest nation (this allows us to test the global mapping function). 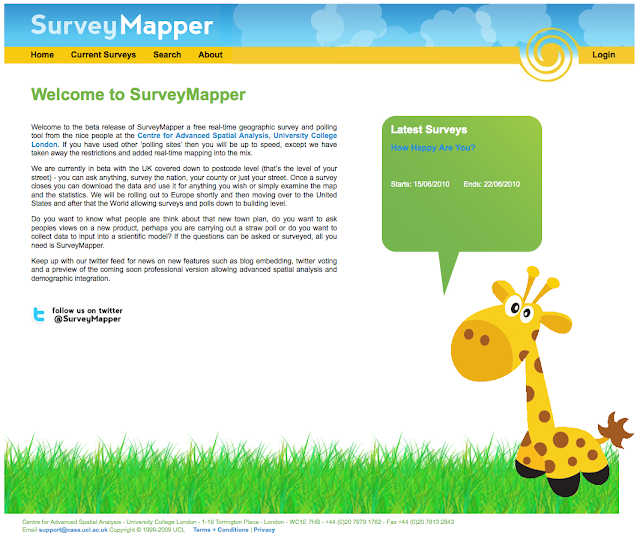 To take part head over to SurveyMapper.com and then select Current Surveys – thanks a lot if you do take part. Keep up with the SurveyMapper twitter feed for news on the beta release, new features such as blog embedding, twitter voting and a preview of the coming soon professional version allowing advanced spatial analysis and demographic integration. nice idea but you could tune it a bit to be truely geographic and work like an upgraded version of Team Map from Mapchannels (for example with survey questions in info baloons poping’up from items on a google map).